Total health, natural weight loss, increased all-day energy . . . your breakfast holds the power! The vegan diet is more popular than ever, and people all over the world are touting its healthful benefits—longevity, energy, and even weight loss. For most of us, though, it’s a lifestyle change just too hard to maintain. More important, it’s missing crucial nutrients for optimal wellness, such as vitamins A, D, K2, and B12. With Tiny and Full™, you only have to wake up vegan™ to see the results of a plant-based diet. You’ll discover that eating vegan at just one meal—breakfast—is better for you than if you ate vegan all day long. By including yummy foods with animal protein, such as Greek yogurt, white fish, chicken, and so much more, in your lunch and dinner, you will get a complete, balanced diet that leaves you satisfied on the least amount of calories necessary and gives you a tiny waist in only 12 weeks! 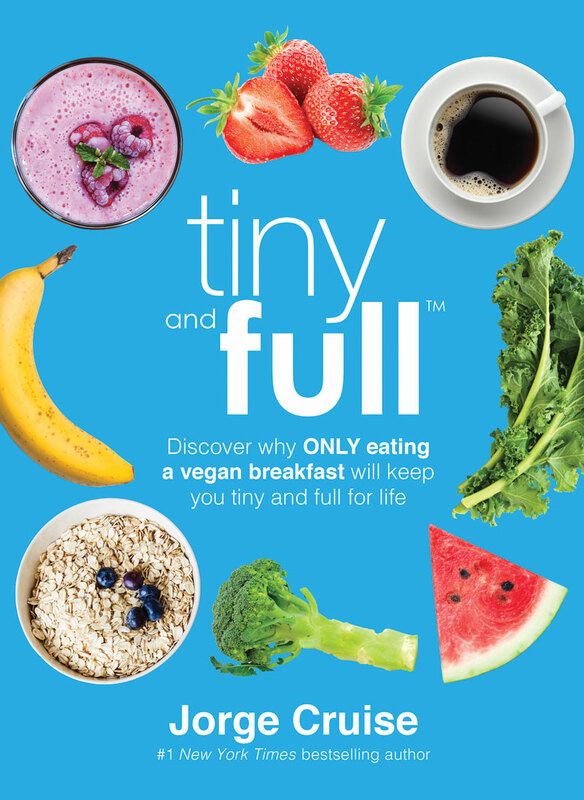 Tiny and Full™ gives you a straightforward meal plan and an energetic fitness program, plus 50 fun and delicious recipes—from a Tropical Mango Blast and Berry Blaster Bowl to Gorgonzola Pear Pizza and even Chocolate Avocado Mousse Cupcakes. This book provides all the guidelines you need to transform your body and improve your life—starting now! Jorge Cruise is internationally recognized as a leading celebrity fitness trainer and is the #1 bestselling author of over 20 books in 16 languages, with more than six million books in print. He is a contributor to The Steve Harvey Show, The Dr. Oz Show, Extra TV, Good Morning America, TODAY, The Rachael Ray Show, The Huffington Post, First for Women magazine, and The Costco Connection. Jorge received his Bachelor's degree from the University of California, San Diego (UCSD); fitness credentials from the Cooper Institute for Aerobics Research, the American College of Sports Medicine (ACSM), and the American Council on Exercise (ACE). His career was launched on The Oprah Winfrey Show in November, 1998. From there, he was featured in Oprah's Magazine in the January 2005 issue and featured again in her book, O's Guide to Life. Celebrities who have since followed Jorge's diet plans include Angelina Jolie, Jennifer Lopez, Lucy Liu, Kyle Richards, Eva Longoria, Chrissy Teigen, and most recently, Steve Harvey.